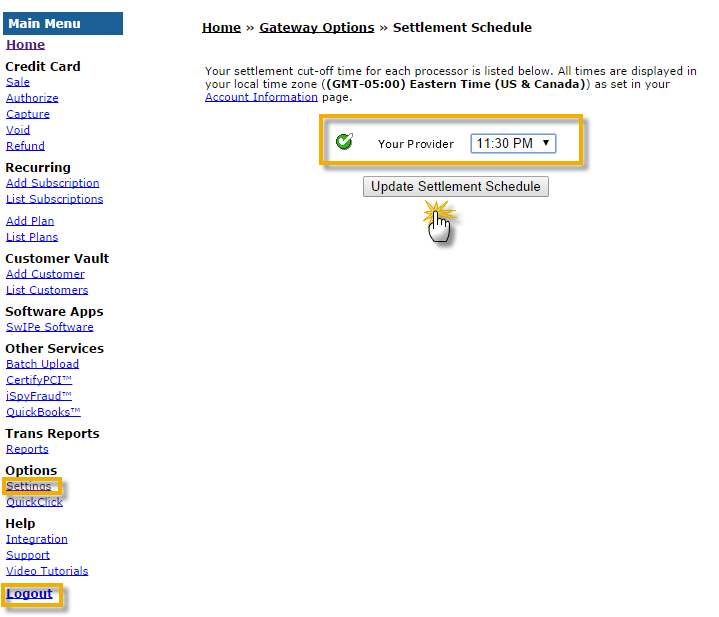 Both SafeSave & C&H Financial Gateways* have a default Settlement Schedule of 8:00pm. This time is the 'cut off' for same day processing, and any electronic payment transmitted after 8:00pm will process (or settle) the following day. Jackrabbit recommends that you confirm your time zone and update your Settlement Schedule time to 11:30pm (latest time available) in your Virtual Terminal. Jackrabbit's reporting time frame ends at midnight daily (based on your time zone). Adjusting your Settlement Schedule to as late in the day as possible will ensure a better match between your Jackrabbit revenue reports and the merchant processing statement. This is crucial when trying to reconcile your bank account, a Jackrabbit Best Practice recommendation. Point to Tools > Credit Cards/Bank Accounts Settings and click on the link to your gateway virtual terminal/merchant login in the E-commerce Info section. You will need the login information provided to you when you set-up your gateway account. In the left menu, point to Settings. Ensure that your Time Zone is correct and click Save. Update the Settlement Schedule time for your provider to 11:30 pm. Click Update Settlement Schedule. In the left menu, click Logout. Any questions on changing your time zone or settlement time should be directed to your gateway provider.